V-Kart – for easy manoeuvring of pipe, steel and other lengths of materials. No competing products come even close in terms of unique design, distinctive safety features and of course quality and durability. We are certain that the new Armorgard products will make your job easier, significantly safer and more enjoyable. Take a closer look at the products below. The V-Kart is a heavy duty cart used for handling long lengths of material. Designed to make life easier for those manoeuvring pipe, steel sections and other lengths of materials. Finished in a powder coat with anti-corrosive undercoat to endure a tough environment and pneumatic wheels designed for easy moving on any terrain. The new addition to the LoadAll range is the LA1500 – the LoadAll with the highest Safe Working Load (SWL) currently in the range. This robust material handling trolley is fully welded and heavy-duty construction, complete with all swivel 200mm diameter wheels to make manoeuvring easy. Easy grab handles improve the functionality of the unit, along with the quick and easy clamping system to secure boards whilst in transit. This user friendly material handling trolley has a SWL capacity of 1.5 tonne. 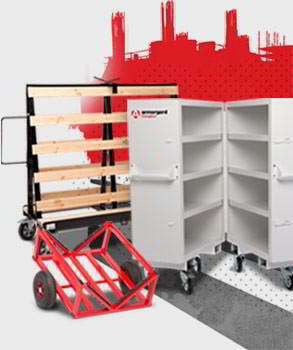 The unique design FittingStor with bi-fold technology to make access to your equipment easier. The FittingStor opens so that it is only 450 mm deep, which saves space when being used in corridors and narrow spaces. Complete with 6 welded shelves to maximise storage capacity. Forklift skids and casks make the unit easier to transport around site, using the easy grab handles. Padlockable clasps to secure the unit. Finished in powder coat for maximum durability.